Setting up new tent and woodstove purchased and delivered. The delegation's gift of a new tent to the camp. DILKON, Arizona -- A delegation of Diné citizens and allies has just returned from a week of lending their labor, solidarity, and prayers to the NoDAPL (Dakota Access Pipeline) movement in Standing Rock Sioux territory. 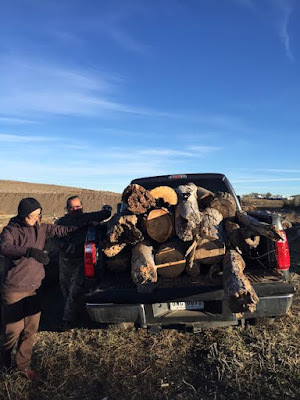 Organized by the grassroots organization Diné Citizens Against Ruining our Environment, the 21-person delegation journeyed from the Navajo Nation to the Mni Sose (Missouri) River, near Cannon Ball, North Dakota. The caravan of one pickup truck, SUV, and 15-passenger van journeyed northeast, through Arizona, New Mexico, Colorado, Wyoming, and South Dakota and covered 1,170 miles: the exact same mileage of the proposed oil pipeline (1,172 miles). 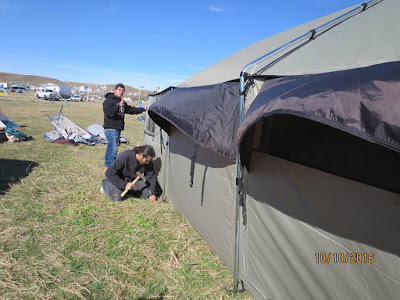 Early in the morning of October 10, Indigenous Peoples’ Day, our delegation set up camp at the Oceti Sakowin resistance encampment of more than 2,000 People, an expansive landscape of tipis, camping tents, RVs, painted school buses, army tents, tarps, and DIY wooden structures abutting the Cannonball River. Among the group were Carol Davis, Lori Goodman, and Earl Tulley of Diné CARE; Teresa Juarez Schreck of the Peace Development Fund and New Mexico Alliance and four generations of her family from Chimayó; Aaron Toadlena of Sawmills; Kendra Pinto from Twin Pines; Patricia Nezzie and Derrick Joe from Dilkon; and Seth Goodman and son Kiyaani from Denver. Diné relatives Ilene, Gary, Kyle, Seana and Dominic Mitchell of Dilkon joined the group later in the week, and the delegatifon linked up with other allies from Navajo Nation, including Kern Collymore of Gallup/Lupton, JourdanBennett-Begaye, Rob Eldridge, and Dana Powell and Ricki Draper from western North Carolina. 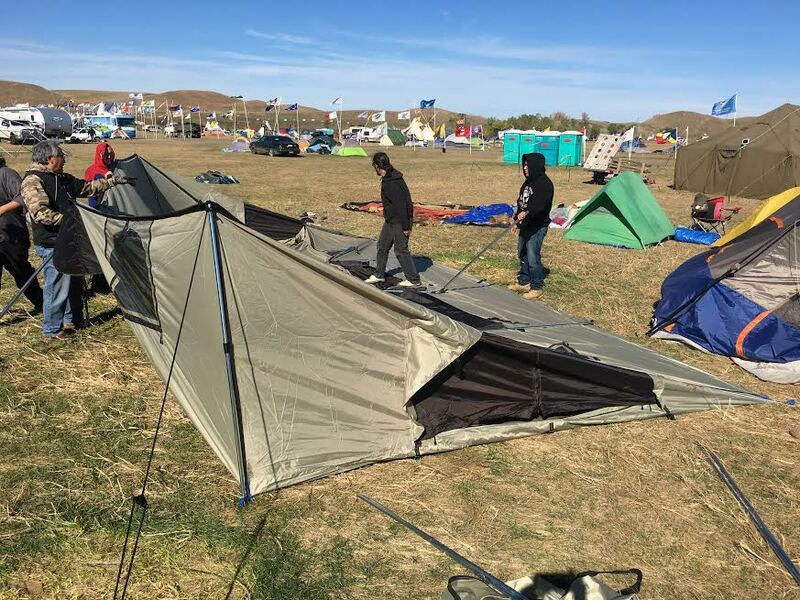 On April 1st, 2016, citizens of the Standing Rock Sioux Tribe established a Spirit Camp on the proposed route of the Dakota Access Pipeline (DAPL) to protect water sources, land, and sacred sites from the $3.7 billion oil pipeline that is set to run from the Bakken shale fields of North Dakota to Illinois, moving 470,000 barrels of oil per day. 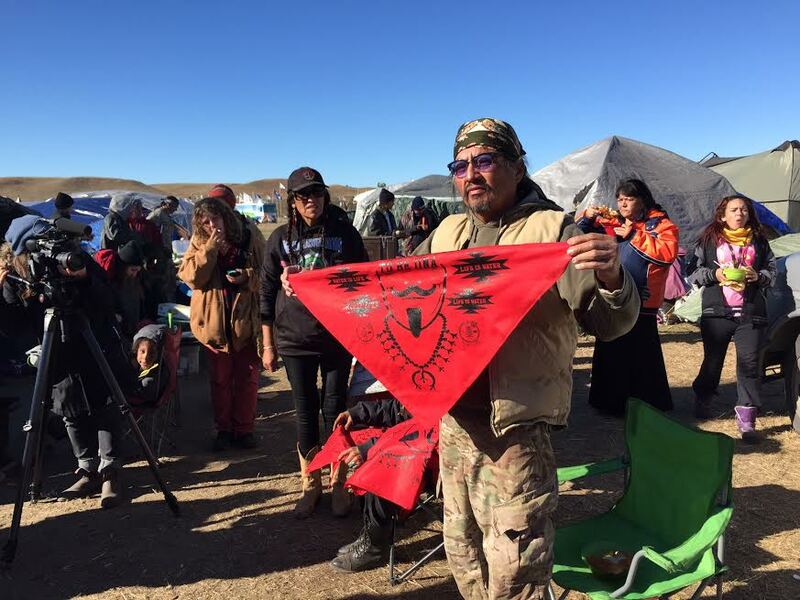 Hundreds of Native nations from the United States, Canada, and Latin America have joined the Standing Rock Sioux Tribe since April, becoming the largest gathering of indigenous people in over a century. There are now three encampments along two banks of the Cannonball River: the original camp called Sacred Stone and the Rosebud camp are on the south side of the river, and Oceti Sakowin camp is on the north side. Declaring themselves “protectors not protestors,” the many Nations now gathered at Standing Rock have a new vision of multinational indigenous resistance, prayerful action, and trans-border resource sovereignty through nonviolent direct action, the arts, and social media to stop the “black snake” that threatens the Missouri River and its watershed. They (and we) are water protectors and land defenders, demanding the U.S. Army Corps of Engineers and Energy Transfer Partners to immediately cease the pipeline construction, as bulldozers consume more and more land in the black snake’s dangerous crawl toward the Missouri River. Misrepresentations in the media have depicted the prayerful assemblies as “riots” and the water protectors as violent protestors. Military drones and helicopters flew over the camp almost daily, surveilling the tipis, horses, tents and protectors below. 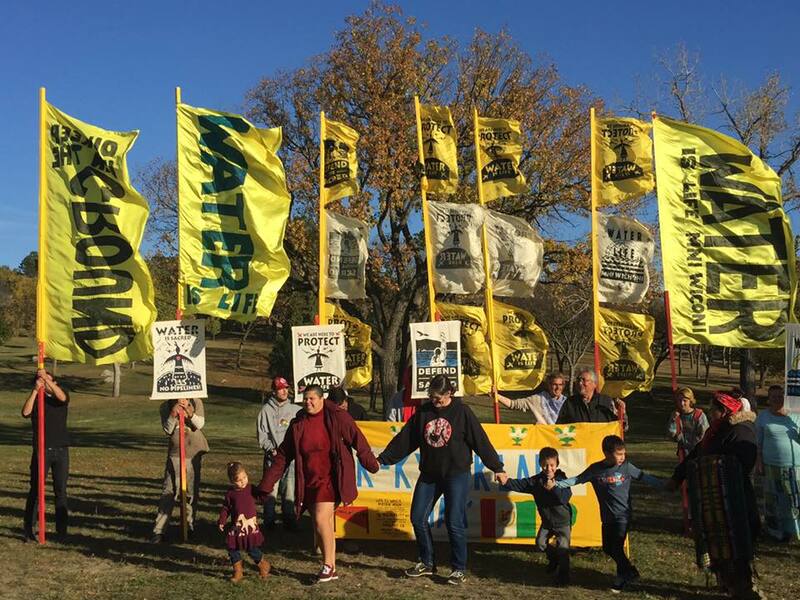 We found a space that was vigilant, yet welcoming – full of laughter and song as well as a strong sense of urgency to declare, Mni wiconi … water is life! At the invitation of Earl Tulley’s relative Jeanne Roach (Lakota), the Diné delegation nestled our camp next to the Wild Oglala Kitchen, in the center of the Oceti Sakowin encampment. Many in this group have been here for nearly three months, and most plan to stay on through the coming winter. The elders welcomed our group, offering a warm fire, hot coffee, buffalo and potato stew, and thick grilled bread we mistook for “tortillas” to fortify us against the very cold weather. Feeding nearly 80 people a day, Oglala Kitchen – led by the formidable cook and storyteller Tweetie – is one of at least four open kitchens in Oceti Sakowin, crafting wood-fired stews and other meals from the generosity of donated foods, the labor of many volunteers, and the inventiveness of Tweetie’s recipes. The Diné cooks reciprocated, offering sizzling frybread cooked on camp stoves and a feast of stew and roasted mutton (thanks, Kern!). Meat from the head of a freshly cooked Churro made for special breakfasts, with cowboy coffee, as the sun rose and we huddled around Mario’s well-kept fire ring, thawing out from the 22-degree night before. Each day, all hands were on deck cooking, washing dishes (with hauled-in water), stoking the fire, sorting through donations, and sharing resources (sleeping bags, hand warmers, mugs, snacks), all amidst both laughter and tears, as we told stories, sang songs, and each experienced in our own ways, together, how much is at stake in this struggle. Bright red bandanas bearing the phrase, Tó’ éí ‘iiná (Water is Life) served as special gifts to our new friends, identifying an extended family of relations. 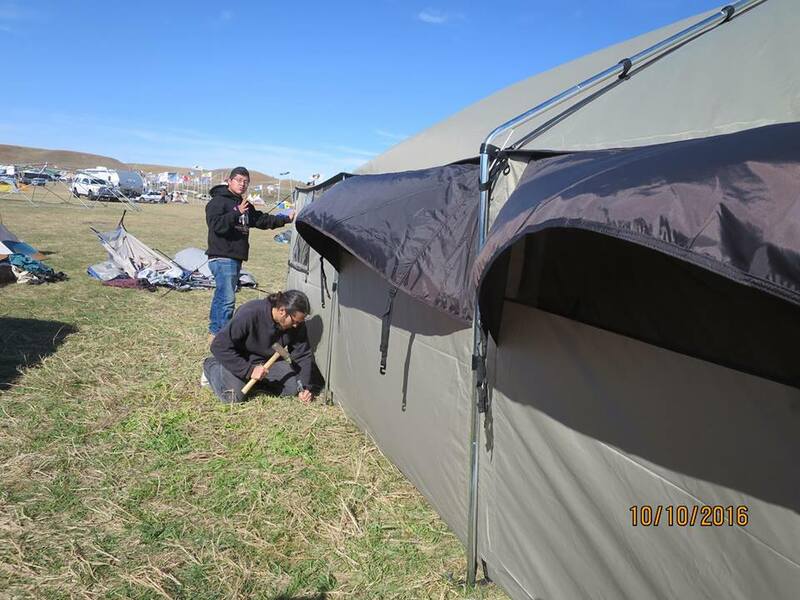 Collectively, our delegation brought in over $2000 of food and medical supplies to Oceti Sakowin, with funds mobilized by Diné CARE and by students from Boone, North Carolina. The delegation also helped facilitate generous contributions of cash, winter clothing and food from the Puyallup Tribe and David Turnipseed and family from Washington state. 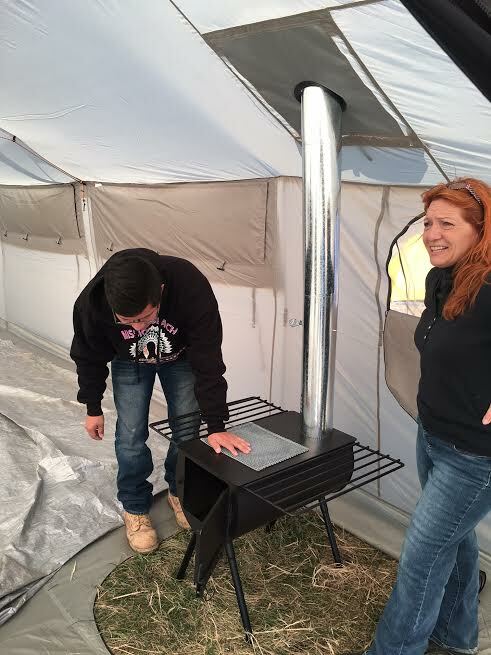 Diné CARE brought in and set up a solid, military style Cabela tent, outfitted with a wood-burning stove, large enough to sleep ten to fifteen people and store dry goods. The Southwest delegation lent support in others ways, too, with thinking and planning as well as with designing and creating. Elders in our delegation participated at the invitation of Lakota elders in a council discussion, weighing the pros and cons of relocating tipis, tents, fires, and the kitchen closer to the main entry or closer to the river, as a winterization strategy. Mr. Tulley and Mr. Toadlena creatively repurposed a geodesic dome structure, covering it with tarps secured with found wire and rope, staking it to the ground, and then installing handmade wooden shelving for canned goods and other supplies, creating a new and huge walk-in food pantry and meeting space for the Oglala campers. Observing the rapidly dwindling firewood reserves and the dropping temperatures, we took the Diné CARE pickup truck to Bismarck and returned with 3/5 of a ton of wood, a chainsaw, and directions in obtaining the city’s forestry department’s wood remnants – the thriftiest way to get the largest amount of firewood. At other moments during the week, members of the delegation joined thousands of others in prayer, in social media self-reporting, in counsel, and in direct actions. Mr. Tulley spoke at the sacred fire on October 14 while the day before, we gathered at the Standing Rock Prairie Knights Casino for a benefit concert by our long-time friends and allies, Indigo Girls, organized by Winona LaDuke of Honor the Earth. We visited other camps, greeting old friends from the American Indian Movement, Honor the Earth, Indigenous Environmental Network, Indigenous Women’s Network, First People’s Fund, and other groups, and making new friends with folks from the Two Spirits camp, from Shining Light Kitchen, from New Orleans, Oklahoma, California, North Carolina, and just across the river in Standing Rock. On our final night, Dennis Banks, now 80 years young, came to offer prayer over the evening meal at Oglala Kitchen, saying: “You all here, this is the good fight. You are fighting the good fight. And we are in it, no matter what happens. But still, we must win. We must.” Banks then smiled and began to dance, locking elbows to swing other dancers, as a musician played his fiddle by the fire. As we travel home this weekend, we are filled with images, sounds, smells, and emotions from the week, and the acute knowledge that we connected with one of the most urgent human rights and environmental issues of our time. We each aim to deliver that energy to our home communities along with a call to increase each of our own commitments to considering how we impact the next generations and what we are called to do, right now. As the Diné and Chimayó delegations greet their extended families and neighbors, and continue to work to end violence, abuse, and intensive resource extraction in their home territories, the noDAPL movement offers an anchoring point for everyone’s ongoing work. Relationships formed on the Standing Rock prairie reach across the continent and the globe, connecting diverse struggles for self-determination and social justice. The black snake in North Dakota has iron and steel replicas in the Southwest, poisoning Diné water and land, forcing difficult questions about the future of Navajo energy development. As we continue to send support back to Standing Rock, we might allow the new and renewed relations of this week to build power for all our work, in each of our homes. In Bismarck, celebrating Indigenous Peoples Day. For more photos and the latest updates on the movement, follow #nodapl on Twitter, Instagram, and Facebook, and like Diné C.A.R.E. on Facebook.